On Saturday, July 22, 2017 at approximately 3:14 p.m., M-LFD Companies 3, 4 and 5 were dispatched to 73 Nassau Road for a reported house fire. Deputy Chief Gobbo (8704) was the first unit to respond and was advised by M-LFD dispatch that they had received a phone call from a passerby reporting smoke coming from the eaves of the home. DC8704 and E8740 arrived on scene within minutes of the alarm and found smoke venting from the attic of the home. With this, the M-LFD Ambulance Unit was requested to the scene. The crew of E8740, lead by Captain Dolan forced entry into the unoccupied home and located a contents fire in the basement. A hoseline was stretched and brought into the home to extinguish the fire, which was contained to just one room in the basement. The crew of L8743, E8758 and E8735 assisted with overhaul and venting the residence. 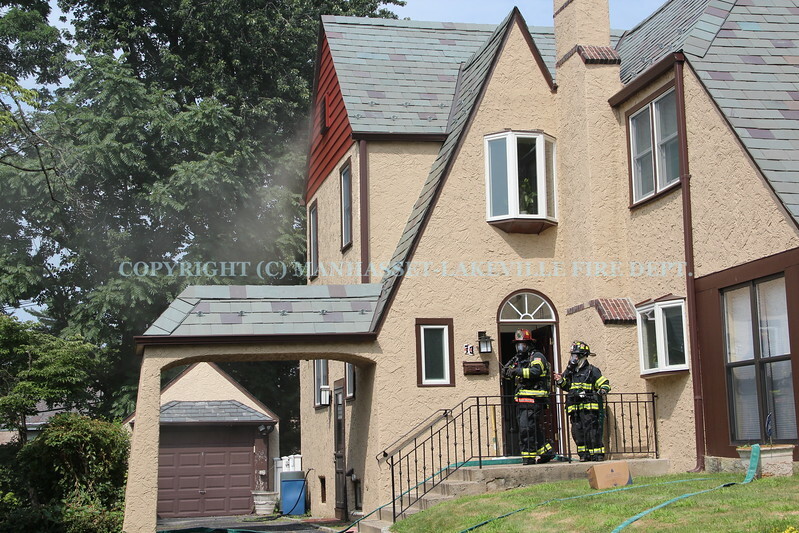 All photographs, videos and write-ups posted on the Manhasset-Lakeville Fire Department's SmugMug website are the property of the individual photographer or writer. No content may be re-used or published without the owners consent. For any information about this website please contact webmaster@mlfd.com. Thank you for visiting our website!